Topolovac´s sculptures and objects have their origins in space, in the earth, and in building excavations. Satellites, unearthed glass objects, and a cast of the ground – three compositions attempting to reveal something about the composition of our planet. 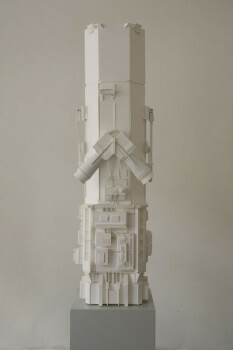 In a playful, tactile, historical manner. All of them have in common the fact of their own innate evidential context. 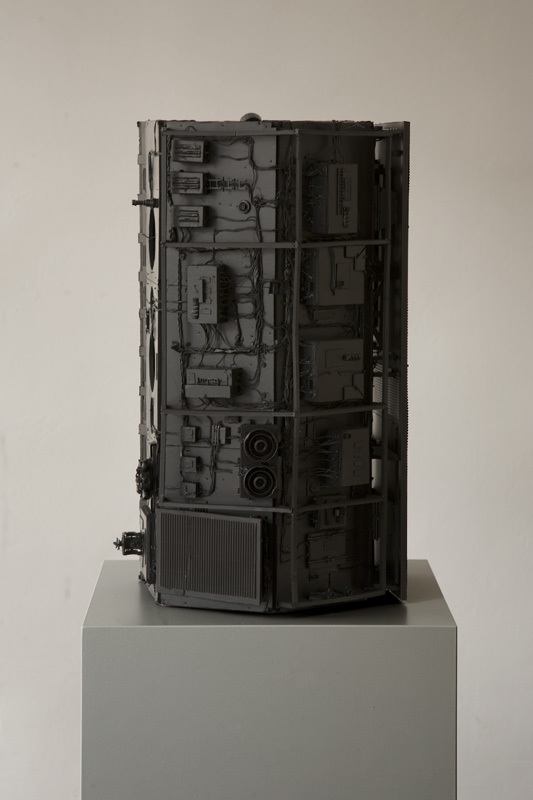 Their origins lie thousands of kilometres apart – as sculptures in Topolovac’s exhibition, they are gathered together as parts of the puzzle of how things appear. Satellites circle our planet in order to create a comprehensive model of the Earth’s surface – one scan for geologists, cartographers, military analysts. Is what is being recorded here a drastically inexperiential landscape – and the end of its romantic interpretation? Once the satellites have served their purpose, they are guided out of their path of orbit and burn up in the Earth’s atmosphere. The ultimate solution for sculpture as ballast. Nothing remains. 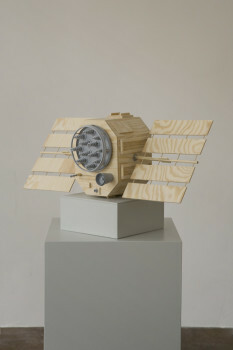 Topolovac exhibits models of these Earth-observation satellites, the achievements of research and the military, reconstructed in paper, paint, and plastic, still intact. 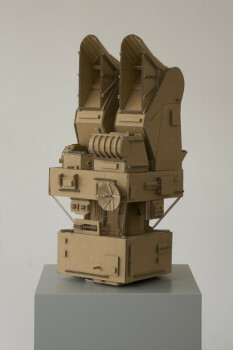 Technology as fascination; the new machine of self-observation. Here the centre stage belongs to what is impressive, what is useful, what is playfully appropriated. The end faced by the actual machines already points to another aspect: what is destroyed. 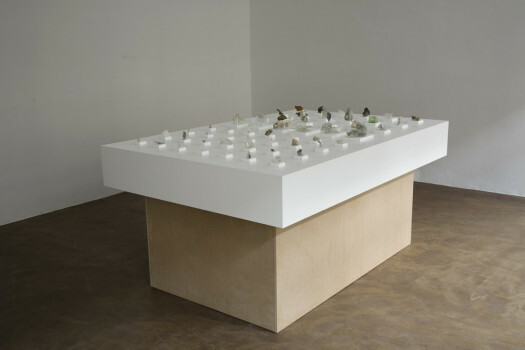 Over the last years, Toplovac has collected unearthed glass objects from Berlin’s building excavations. In Berlin, new houses are often located on the sites where previous buildings burned down. Often the foundations and cellars remain intact, and are today being excavated. Glass begins to melt at 600 degrees Celsius. The infernal end of the Second World War saw the melting-together of flasks, ashtrays, milk bottles, sweetie bowls, salt and pepper shakers, knick-knacks. 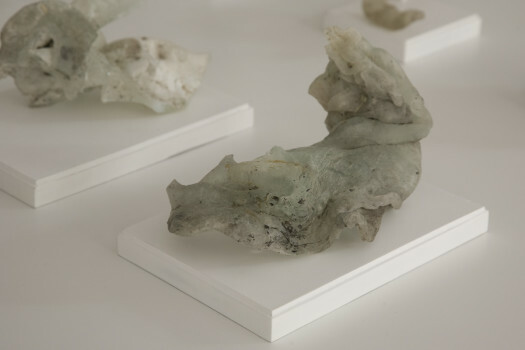 What remains are innovatively formed glass pieces, narrative artefacts, on display as parts of a museum collection. They tell their stories from the earth. Here we see the return of a side to Topolovac´s creative practice which first became apparent in his mountain casts: his search for the meaningful within the marginal. 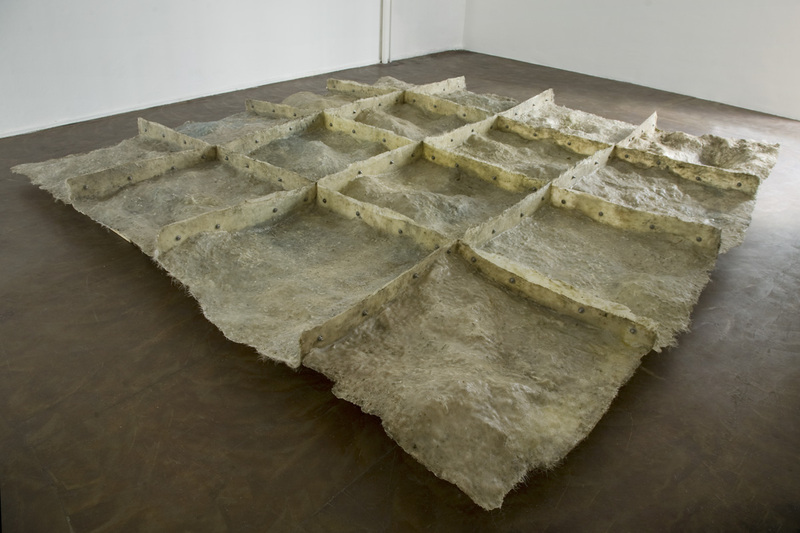 Philip Topovolac finds landscapes, even mountain ranges, in Berlin’s gravel pits, and makes polyester casts of them. 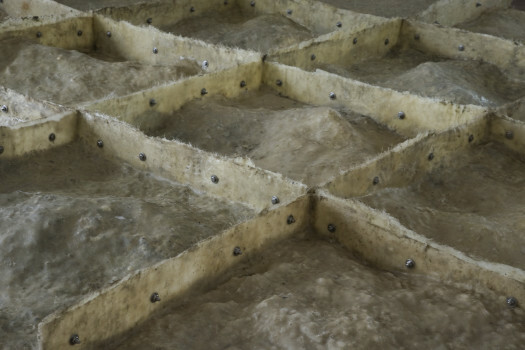 For this exhibition, he has chosen a square piece of ground with topographical variations. The result is a crusty shell which can be interpreted as the hollow mould for a sculpture, an instrument of imitation. The bolting-together of the 16 individual pieces creates a pattern-become-object, its solidity and the method of its creation the very opposite of virtual. Unlike with the mountain casts, the focal point here is less the deconstruction of a romantic symbol than its existence as part of the world, in its true size. The ratio of 1 to 1 is inherent to casts. By contrast, the image-based results of the Earth observation satellites can only appear abstract in the extreme, giving the act of casting, of man-made reproduction, a unique, despairingly realistic note.